The Power of the Last Practice. I walked up the stairs and got ready to roll out my mat for my last practice on Friday morning August 28th at 6:20 a.m. A room full of students participate in a special puja ceremony around the temple. This started on the new moon August 14th and would end on the full moon, August 29th. Fourteen days of dedication. Placing my mat on the floor, I was drawn into the chanting energy, making a blessing over fire and drinking what tasted like sacred coconut water from my hands. "Om Gam Ganapataye Namaha" over and over. Tears rolled down my face and many of my fellow students. Eddie explained that in a few days, the large Ganesh inside the temple would have its energy transferred to a smaller, portable Ganesh until the temple found a new home. Large Ganesh would become like a sacred, hibernating bear. This humorous remover-of-all-obstacles would sleep on a red silk cloth in a special room until returning to the temple's new permanent home. "Okay, let's get ready to enjoy your last practice," said Eddie. An embrace occurred. More tears. More than forty mats unrolled in rows of eight, squeezing every person in. More emotion. "Eddie" is Eddie Stern, who with his wife Jocelyne has owned, and operated Ashtanga Yoga New York (AYNY) and Broome Street Temple (BST) at the corner of Broome and Crosby Streets for the last fifteen years. Emotions ran high all week. At first I thought the vibrations and extra high energy at each morning's opening invocation was just me. In all my years practicing here, I had never felt the opening invocation vibrate through me so boldly. Turns out it wasn't just me. When chatting with fellow yogini Carla, she agreed it had never been as powerful. Annie, another yogini pal emailed me after her last practice and said she felt teary after Eddie spoke. For a host of reasons typical to New York City housing, AYNY/BST had to give up its lease. All students were informed of this over the winter, along with shifting "last day" dates. None of us wanted closing day to come, whenever that would be. With that would come the last practice. I've had the good fortune of practicing at AYNY for nearly fourteen years after an introduction by my friend Lisa Schrempp, even with my five-year hiatus. While NYC has over 300 yoga studios, there is only one AYNY/BST. Ashtanga Yoga practitioners from all over the world visit when in NYC. Two weeks ago, I met a young lady vacationing from Israel. She was speechless from the energy housed on the second floor. I've seen AYNY go through many fascinating iterations. The outside door was once electric blue. So was most of the lower level of the building housing a restaurant. There was no sign at the studio, just the blue door. One just needed to know the studio was here. When I first started practicing here in 2000, Sanskrit words covered the studio walls. One day, I asked Eddie what they meant. He said it was the Hanuman Chalisa. I went home to find out what that meant. I knew Hanuman was a monkey. I found out Chalisa was a devotional hymn. I remember when the bathroom was in the front of the room and finishing poses were done at the back. I remember when Eddie had a mini-desk that pulled out of a wall, and then he shifted to an office elevated in a mini loft. I remember practicing on a Friday and returning Monday to see a new bathroom. I remember having my first homemade chai tea, savoring its taste while sitting on colorful floor cushions in the back room. I remember seeing stacked sweatpants and a sign, "take one." I still have my AYNY black sweat pants. The current Temple and practice space has been intact since the building was bought and the space was brought up to code a few years ago. I was still on my ashtanga hiatus then. Upon returning in October 2015, I felt awed. The late Sri Pattabhi Jois, founder of Ashtanga Yoga blessed this temple. Every time I practice here, the awe returns because this space is truly blessed. I marvel that when I returned to the practice a couple days a week, I fell right back in with a community of people--I didn't know their names, yet it didn't matter--we all know each other. "You're back!" "How are you doing?" Felt like yesterday, not five years. This is a practice and a space where we were all visible yet can be invisible to focus on what's important. During the last week at AYNY, memories arose, like the very first time I practiced Mysore with Eddie. I was intimidated surrounded by so many extraordinary practitioners. It didn't matter that I had been doing the entire first series elsewhere. "That's all for today, Debby," Eddie called over. I was stopped my first day after Navasana (boat). I stayed there for several weeks. It was humbling. More importantly, it was safe. I progressed to the next pose when my body was ready, not my ego. One year later, I completed the entire first series. Another time, Eddie was adjusting me in Baddha Konasana (cobblers pose). Suddenly he started sneezing and fell over me! No one was hurt, just a big laugh! I also remember the year when Eddie met with every single student (there were a lot) to discuss their practice. Then there was the time I brought my twin daughters to AYNY. They were 8 years old and Lili, Eddie's daughter, was 4. They played together upstairs in their apartment while I practiced. My girls are now 22 and Lili is in High School! Somewhere in between, my daughters were getting ready for their B'nai Mitzvah. Eddie felt I needed to connect with his sister Amanda, who had written the book, You are so not invited to my Bat Mitzvah. Because of Eddie Stern and AYNY, I got to experience the late Sri Pattabhi Jois. My first time was in 2000. We were mat to mat with 400 people. I still have my entry card from the Puck Building with a photo of Pattabhi Jois. Pattabhi Jois would say to me: "You come to India." I would reply: "You come to New Jersey." I heard he loved Costco. One visit, I bowed down in respect, kissing his feet. Walking to my car, a NYPD traffic cop was writing me a parking ticket. Free parking ended at 8am. It was 8:10am. Somehow the kissing of the feet got me out of the ticket! We all won't ever forget 9-11 or where we were. Pattabhi Jois was in NYC on tour. During my ashtanga hiatus, Eddie and I reconnected at Newark's 2011 Peace Education Summit with H.H. the 14th Dalai Lama. I was overseeing the yoga for the summit and Eddie taught some yoga classes. We met again through our passion to help education rise up through the integration of yoga in schools. He's been involved since 2001: First with Bent on Learning, now with Sonima Foundation to ultimately change national policy. I had started Newark Yoga Movement in 2010 and he was interested and helpful. We have often discussed bringing one of his collaborations Urban Yogis, to Newark. Eddie is humble, full of heart, intellect, and humor. He loves what he does. It shows. He and his teaching staff are excellent. That's why people continue to come, to learn the practice one-on-one. So here I am on Friday, August 28, 2015, at my last practice at AYNY/BST. The invocation matches the rest of the week: Bold, powerful and energetic. Tears mix with my first sun salutations. The room is packed. People wait in line patiently for their time to practice. Shoes, backpacks and bags cover the floor. No one is in a hurry. Everyone is in the energy. This is the way it always has been here. The new Manhattan home will be at Bhakti Center. 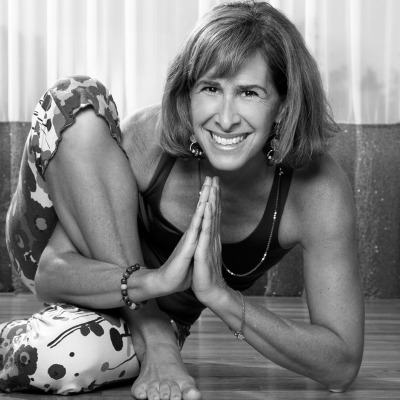 Limited classes at Brooklyn Yoga Club began Sept. 8. In the end, it doesn't matter where our new home is because it's about the energy. We bathe in this energy each time we practice, so that having a beautiful temple is a bonus. The portable Ganesh will bring that energy currently housed in the BST to the new space. It will mix seamlessly with the students and teachers vibrant energy. The sadness I feel at the closing of our Broome and Crosby Street yoga haven is shared by many others. I will miss my routine of driving up Crosby Street, picking up a chai and driving back to New Jersey. This chapter graciously closes at the physical space. In the end, it's about the people. The energy. The humility. The smiles. The authenticity. The community. I finish my final lift before savasana (final rest). Twenty-five breaths in utplutih (full lotus lift). I move into some pranayama (specific breathing techniques) before savasana. Eddie had given complimentary pranayama classes during late spring through early summer. As I lie in my final savasana, I listen to the room with people moving at various stages of their practice all around me. I hear my breath. Slowly, I bring myself back to my seated position, facing the large Ganesh inside the Temple. I bow with eternal gratitude, and say, Namaste. Lover of life, passionate about serving and proud mom and wife. Blazing inspiring trails through yoga. Newark Yoga Movement founder.